Will Resizing a Small Photo Get Me a Higher Resolution? For example, if a customer gave you a small image that was 500 x 500 at 72dpi and wanted it 4000 x 4000 at 300dpi, then you are going to have a rough conversation with your client! Suffice it to say, it’s not going to be pretty, in fact, it probably won’t look as good as you want. So what's so different, why is 300 dpi vs 72 dpi such a big issue? 72dpi is a web size resolution while 300dpi is the lowest standard resolution for something like a photo or brochure that is printed. What is a high-resolution image? A high-resolution image is anything that has at is 300 dpi high resolution with a larger pixel dimension, for example, 5000 x 4000 pixels. If you have an image that is 640 x 40 at 72dpi, you definitely have too small of an image! To avoid image resizing issue you might consider an XXL stock image from the Stock Photo Secrets Shop instead. Our image subscriptions INCLUDE all image sizes up to XXL size (meaning you can print confidently at A3 size with 300dpi or 6’ x 6‘ with 72dpi). 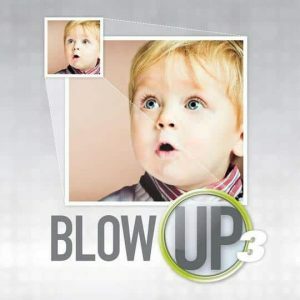 If you want to use your own photo -try out a software called Blow Up 3 by Alien Skin called, that does a great job enlarging photos. If you don't know how to increase the resolution of a photo, then we have put together some ways you can try increasing the resolution of your small image. Trying to make a digital image larger often results in quality loss and pixelation. While you cannot typically make the image bigger and maintain the same quality, there are things you can do to achieve a higher resolution image. The best place to start is to ensure that you are picking a large enough size image from the get-go. Evaluate what size you need prior to purchasing the rights to an image from a stock photo agency. If you are creating a poster, you will want an image with a dpi of no less than 300 and the dimensions that are big enough for your poster. If you are using the image for your website, you don't need anything above 72 dpi, but you will still need an image that has the dimensions at or above your needs. By now you have a better understanding that image resizing isn’t some magic alchemy that can easily increase the size of a small photo. So how do you solve this issue if you or your client downloaded too small of an image, or only has a small photo that will look horrible when resized? 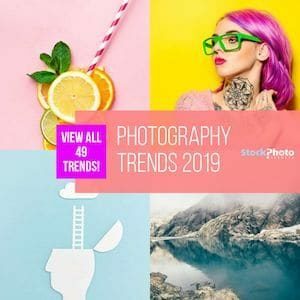 Well, you can repurchase a larger version of a stock photo if you or the client bought too small of a photo, or you can use a special software program that may or may not be able to resize your image. Having an image to begin with that has a big enough resolution is the best recipe for resizing an image effectively and will mean better quality when increasing its size. 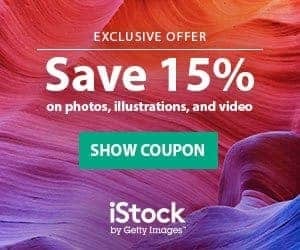 At the Stock Photo Secrets Shop (https://shop.stockphotosecrets.com/) our stock photo image sizes are big and definitely big enough for you to print confidently at A3 size with 300dpi or 6’ x 6‘ at 72dpi. A technique that may work for you is to try “stair interpolation.” This concept has you increase the size of the image in small increments instead of one big change. Instead of increasing the size from 100% to 300%, try increasing the image by 10% at a time and repeat this process until you have the size you are looking for. There is also a free program that can help you called IrfanView. Unfortunately, it appears that there is not a version for Mac. Working with what you've got will require using editing software, such as Adobe Photoshop. One option is to resize the image, not to be confused with resampling. By resizing, you are changing the image print size, but maintaining the pixel dimensions. You will have good image quality, but in turn, you will be sacrificing your print size. If you use resampling, which changes the pixel dimensions, you will have a loss in quality when you resize. There are other software programs such as Vector Magic, that will take your raster image and convert it to vector. Once an image is converted into a vector, you can resize the image in any way you need, but changing your image into a vector image isn't necessarily a good solution for all of your photos. You may want to start with the free download prior to purchasing the software to see if it is right for you. 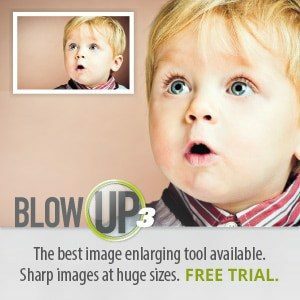 You can also try out another program by Alien Skin called Blow Up 3, that does a great job enlarging images and keeping them looking clean looking. Another option, especially if your client is older and has an original print of the image, might be to have it scanned with a high-quality scanner. By scanning a photo, you will be able to pull out a larger resolution to your computer than the small file. If you don’t have a scanner, many pharmacies and office supply stores will do it for a small price. Good Luck Blowing it Up! Unfortunately, you may not always get the biggest size image that you need, whether it is from a client you are doing a project for or perhaps a mistake you made when purchasing from a stock photo agency. Sometimes it might be better to go back to the drawing board and get a large image that will allow you to play with image resizing without affecting its quality. If you are looking for something economical, we have a great deal right now that gives you 200 XXL stock photos , vectors, and fonts for just $99, which will allow you to print confidently at A3 size with 300dpi or 6’ x 6‘ with 72dpi. While software options are available, it doesn’t guarantee you’ll get a good enough image without pixelation. Using image-editing programs like Photoshop, or Blow Up 3, and if it’s a graphic try using Vector Magic. All of these might work for you, but don’t expect them to be higher resolution image size! Icontail! – 2050+ Professionally Made Icons in One Icon Pack – 50% OFF NOW!